Aayisrecipes would not be a “Konkani site” if I had missed this dish. Hittu/khotte is one of the most popular dishes for Konkanis (This is also popular among Kannadigas). For most of the people, it is just a festival food, but at my home, aayi prepared this whenever we wanted. 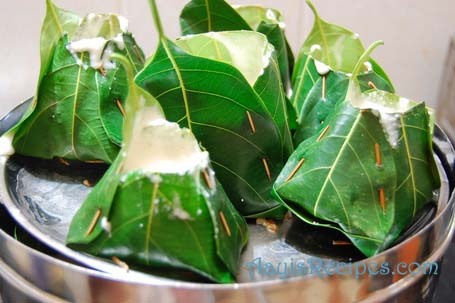 She made these small baskets with jack fruit leaves and then poured idli batter and steamed them to get the “hittu“. 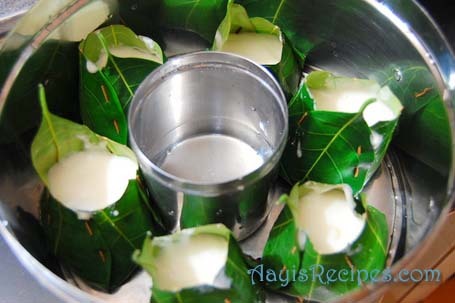 Though it is just idli batter poured in these baskets, the ‘hittu‘ gets a very distinguishing aroma from the leaves. Hittu/khotte is usually prepared during Ganapathi festival and served along with sprouted moong sidedish(mooga moLe randayi). 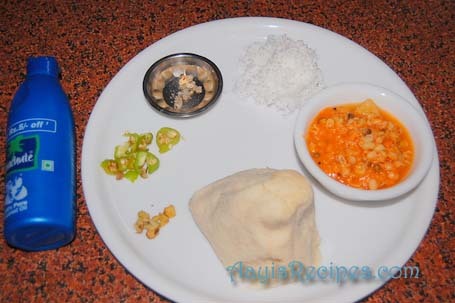 The other most popular combination is called “hittu-hinga udak“(hittu with asafotida water). Hittu with few drops of coconut oil, asafoetida water, ginger pieces, fresh grated coconut, salt and green chilies. While eating, the hittu is powdered using hand, chilies are crushed in salt and mixed with coconut-asafoetida water-salt-ginger. Then the hittu powder is mixed with this coconut mixture. Few drops of coconut oil are put on top. This tastes so amazing that once you eat it, you will never ever forget the taste. (This is also done with nomal idlis). Many of us also eat the “hittu-hinga udak” combo with sprouted moong sidedish (mooga moLe randayi). The mixture is dipped in the sidedish and eaten. 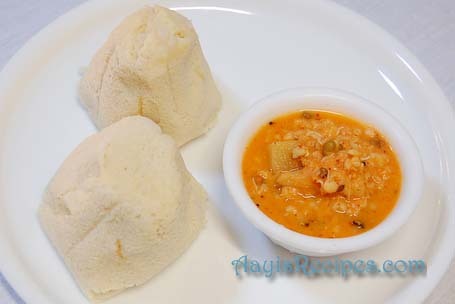 At my home, we liked to eat this hittu with sambar and chutney just like idlis. As I said earlier, the batter is same as the idli batter. But I am going to post the pictures of how to make these baskets here. 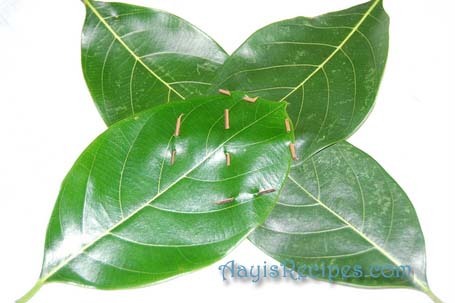 These are woven with 4 jack fruit leaves and thin sticks (called as “shigir” in Konkani). These sticks are either got from the betel nut tree or coconut tree. 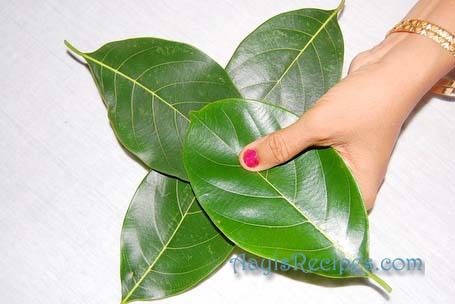 Hold 4 leaves with ends one upon another as shown. 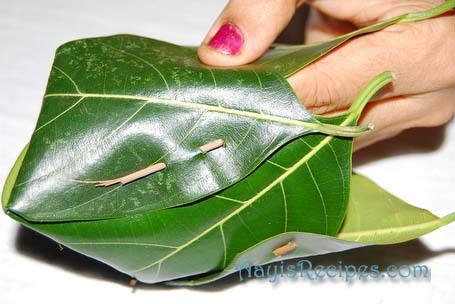 Fix one leaf to the second with the help of stick. 5 small sticks are necessary to hold all the leaves together. The leaves with the bottom woven looks as below. 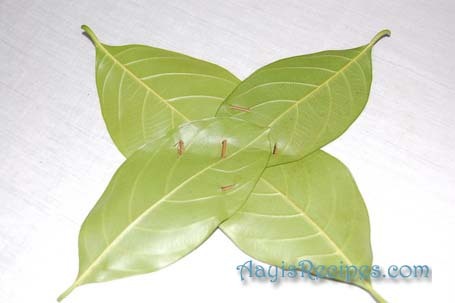 Now fold two adjacent leaves taking care there is no space in between. If there are small holes, the batter comes out. 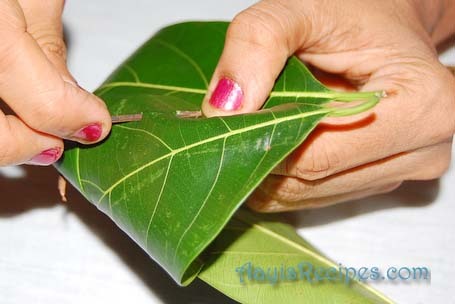 Cut the tips/ends of the three leaves. 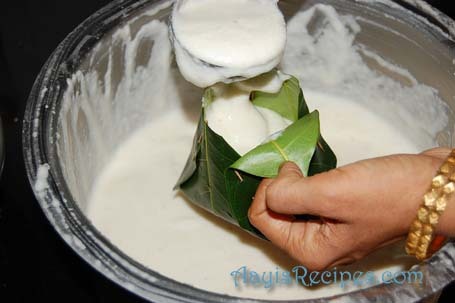 Leave one as it is so that when the ‘hittu’ is cooked, it can be lifted easily. Following is the traditional steamer used to steam these ‘hittus‘. Pour the fermented idli batter in these baskets. Click here for an easy way to make these. Oh! My all time favorite!! Very nice pictures!! Thanks so much!! Thank you for this wonderful post Shilpa, it did come straight out of your heart. The step by step photos are so useful, i loved those leaf baskets. Shilpa, that looks so wonderful! You r brother has taken such lovely step-by-step pictures, that I can almost smell the hittu kadubu! this despite the fact that i’ve never even heard/tasted this dish before!! Oh my God Shilpa. What patience! Lovely pictures. And I love the taste of these idlis. I have had them in Mangalore and in stations on our way to Mangalore by train. Thye taste so yummy. I think the leaves give it that texture and taste. Thanks for u’re wonderful post. your family took lots of interest to explain thease step by step..I really appreciate them for there effort. This dish is really awesome. I hope I could eat them straight away from the picture…thanks for sharing such a wonderful dish. This makes me run to kodkani where my mami makes these:). First when I saw the snap I wondered where you got these leaves from,really must admire your family for having patience to take step by step photos and send. Thank God, I hit upon your site. Hmm. Lovely koTTes with hesru kALina padArtha. My father would sit the whole evening before Ganesh Chaturti to make those containers. koTTe seTToode ond doDDa kelsa. And next morning mom would prepare fluffy idlis. Thanks for bringing back those memories. You have given a very detailed description. Its just perfect. 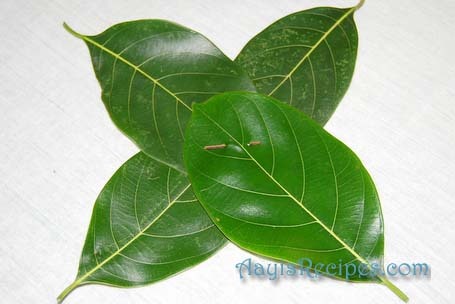 Wow Shilpa…..First before reading, i was very happy that you found jackfruit leaves in US. After reading the first para, i realised this is aayispost. Kotto is one of my favorites and my mom does it regulary, although i have helped her with khote pan viNduche. Missing it more after reading your post. Very illustrative. Thanks for sharing. Great post. At our place, we have khotto with madgane(channa dal paisam) or pickle. Oh My God!…this is the ultimate konkani dish…for a minute, I was in a daze wondering how u managed to get ‘khotte paan’!…it all made sense a couple of minutes later… absolutely looooveeee the khotto-hinga udda combo which is relished by all during Ganpati….it reminds me of home and mom…SIGH! wow…these are awesome…i wish i had grown up having these hittu! very beautiful to look at, i only hope to eat these sometime! The jackfruit leaves are breathtaking. Thanks to you and your whole family for sharing. Thats was really touching post. Its amazing how your blog is turning into a family affair. Thanks to your Mom and bro. After I moved to Blr. In my office cafeteria they serve kotte kadabu. The guy at the counter was so nice he would explain to me all the items on the menu so that I could make a choice. But since it is a cafeteria they use banana leaves. Smile. Love the step-wise photos your brother has taken. I should ask my brother to look at this…all he does is make fun of the food pics in my blog. Coming to the US dont we all long for authenticity and tradition. Hoping to see more creations directly from the source of your recipes. Thanks for posting this. This post not only brought back the ‘hittu’ memories & even brought back my father’s love for these.He loved hittu more than anything.And he always loved it with ‘hinga udaak’.Our maid used to make these containers for us.She still does.Sometimes my aayi even made with just spreading the leaves on the container, just to get the aroma.This one is absolute must at least once or twice when we visit India everytime 🙂 Thanks for the wonderful pictures. Whoa!! Bow to your mother… actually several bows. I used to knit leaf plates with “moduku” leaves as a kid and I can totally relate to how hard it is with Jack fruit leaves. Wonderful recipe and great presentation. Thanks a lot for all your comments. If not for my family, I would not have started AR.com. It is because of their continuous support, this blog is at this stage today. “Shilpa” is a just representative here who is “marketing the product” :D.
Thanks, Shilpa for bring back sweet memories of khotte. My mom had the designated task of making these khotte baskets at “Chavati”, when we used to to have over 100 people for lunch. And my mom had all the patience in the world to make these baskets (over 400) !! !And the end result used to be such delicious khottes… our ordinary idlis pale in comparison !!! Your website is amazing and am very glad to fianlly see a very tru “amchgele” site…Keep up the good work !!! Hi Shilpa, Wonderful pictures. It brought back fond memories of my granny making these khottes. 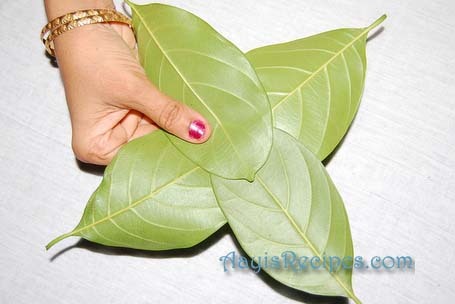 She also used to make small single leaf khotte. We used to fight over who would get those. We still have her do those for us when we are visiting. Thanks again for sharing. I am from the East Godavari district in Andhra Pradesh. This dish is not eaten much in the rest of Andhra but the people in the region I mentioned make it on some special occasions. It is usually eaten with a sweet dip called Thimmanam that is prepared with jaggery, flour, and cardommom. Both my grandmother and mother used to make this dish frequently. Thanks for the detailed description and excellent pictures – you brought back a lot of childhood memories. 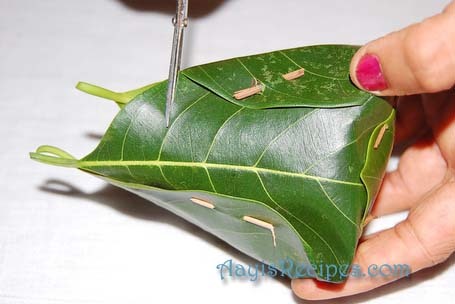 Hi Shilpa, Nice pitures of how to make the baskets out of ponasa paan. I am missing Khotto so much in USA. Wish we could get the leaves here (even mail ordering I dont mind). I grow Haldi Paan & Pathrado Paan in my yard in summer but not jackfruit. Thank you for this wonderful post Shilpa. Wow this looks amazing. I simply love them. 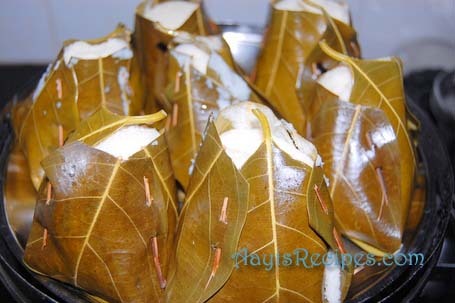 I remember my mother-in-law cooking this for me after my marriage(My in-laws are konkani and I am from north)I simply loved the idea, taste and look.I can have n number of these.thanks for posting this recipe.wher did u get the leaves from? I am leaving a post here for the first time. Kudos to you for this great site and loads of patience. I am also from East Godavari district in Andhrapradesh and as Mr. Prasad mentioned it above, this is a signature dish of that place too. We call this ‘Kottekka buttalu’, may be kotte is as in ‘kotte’ in Konkani ‘buttalu’ in telugu means baskets. We also used to eat them either with the sweet dish mentioned or spicy, tangy coconut and Mango chutney. Kotto means a container in konkani. I am from Andhra Pradesh, and this dish is made in the East Godavari district on Sravana Amavasya day. It is served with raw tamarind chutney and a gravy made with jaggery and rice flour. Yummy. I remember making these baskets when I was younger. Thanks for the pics, I will show my kids. Khotto is the most homey India food for me, b/c it is something I have never been able to do in the states; though now I might think I am not looking hard enough for the leaves. My O-amma taught me to make Khotto when I was very little–in fact, I am the only one in the family who can make “baskets” that stand-up. She was such a wonderful person, and this post really reminded me of her. Great post. Thank you very much. we like this kadubu. we get only in selcted restauraunts here in chennai. Lovely now we can make it at home in regular steamers minus the jack fruit leaves. anywayy yummy… thanks once again.. Though i have not heard or made it, but the site of the picutres look so yummy. i am such a big fan of ur site that whenever i want to make a new recipe i can only think of your site. Thanq so much for the recipe. Thanx for the prompt reply. Though I asked you about the recipe, I could not thank you all these days as I had no chance of looking this for some reason or the other. I am sorry for that. You have presented the recipe so well, I just cant wait to taste it. Thanq once again. I remember my aunt used to make these and we had a huge jacfruit tree and my job used to be to pick the leaves wash and dry them and make the baskets! Incidentally I grew up in Belgaum. I havent had these in years, but brings back fond memories of my childhood! I am a big fan of your site and have been getting a lot of recipes from here, my family and friends love them. I however had a small question for you. Where do you get jackfruit leaves in the US. If you dont, is there any way to substitute them, with something you get in the US. Shilpa: You may get them in Chinese store, I am not sure. 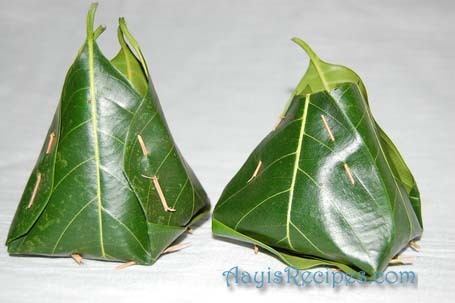 My mom makes them in banana leaves too (I will ask her to post). WOW!!!! I am not trying this…can’t be so ambitious yet…but sure would love to eat this! 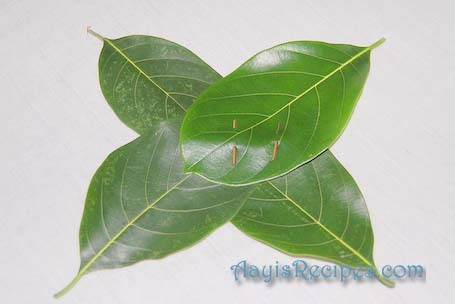 Even i tried making them at home but could not find jackfruit leaves pls let me know where do you get those. Shilpa: These pictures were taken in India. Two days back , when my computer had gone for service, i suddenly developed a love for these idlies, with no net, i managed to get a few jackfruit leaves from a neighbour(i hardly find any jackfruit trees in hyderabad) , recollected the pictures and made them, though they were not perfect in shape as yours, they were very tasty with the flavour ofthe leaves on them, i shall try to send those photos to you soon, thanks a lot shilpa. Shilpa: I don’t know what it is called in Kannada, it is called Pedawan in Konkani. I think it is available in B’lore too. It does not come with any stand. Very good demonstration with excellent photos,traditional essence can be felt! Thanks for those pictures. farach chhan padarth. utkrusht chhayachitra. asach prakar khup varshanpurvi khalla hota fakt dronacha akar vegala hota. aani hyachyabaobar naralachya dudhach kshir detat ka? itaki mahiti dilyabadhdhal manapurvak dhanywad. 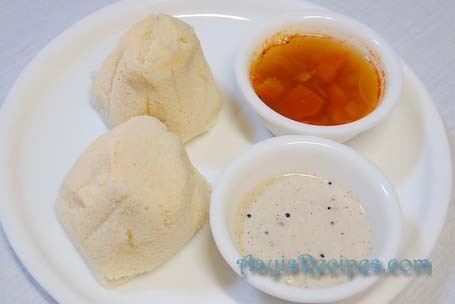 Hi we just toured in Mangalore and ate this wonderful idli. Good to see the illustration and nice to know about the fact that it is idli batter, since my son and husband argued that it is a totally different recipe !!! What an amazing job! !Hats off to you and thank you,thank you,thank you……I was always worried that the good,old and healthy traditonal recipes will be forgotten,not anymore! !One of the best blogs of mine! Will try this year with your pics in front of me…..
original GSB who invented this for us. Enjoy!!! interesting recipe. but what do we do if we dont have the traditional steamer? You can use cooker. Just like you would make idlis. http://foodlooseandfancyfree.blogspot.com/ . 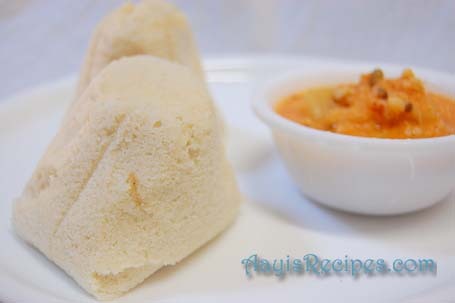 I have been waiting to post about Khotte and found the simple way to make the jackfruit moulds on your blogsite. I would like to share this with the readers of my blog. Do let me know if its ok with you. 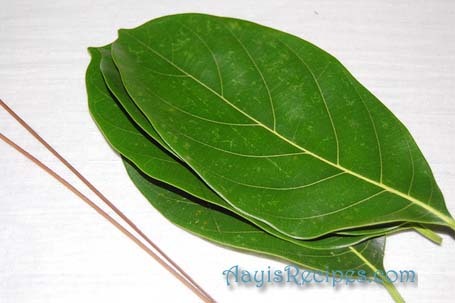 Khotte khavche duvalo … any luck getting jackfruit leaves in US?? These lovely recipes in your blog are bringing back all my childhood memories when I used to relish Mangalore food prepared by my grandmother.